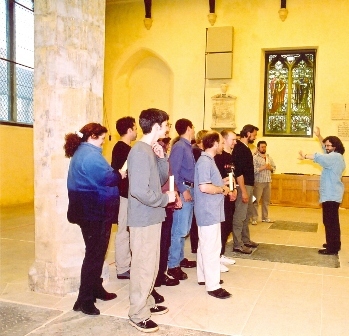 In 2000, it was possible to hold rehearsals in the newly opened National Centre for Early Music, in former St Margaret's church. Composer and Musical Director Dr Richard Shephard is in the middle of the picture, leading the orchestra in rehearsal in the NCEM. 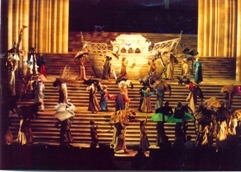 The Mystery Play Archive holds more photographs taken by cast member Linda Terry backstage at this production. You can find some of the photographs here or here. immediately confronting him is Ray Stevenson (Jesus). 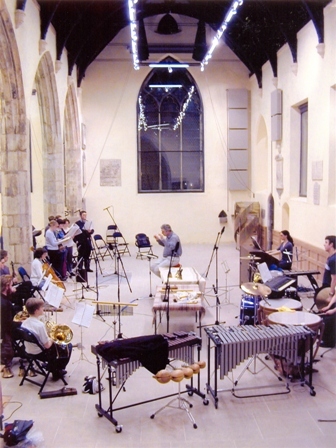 Here is a link to a photograph taken during dress rehearsals in the Minster and donated to the NCEM Archive by Jude Brereton. As He creates the world, God (John M. Hall) stands at the centre of the Minster. Below are His good and bad angels: left is Gabriel (Tom Davey) and right is Satan (Rory Mulvihill). 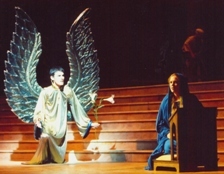 Rory had played Jesus in the 1996 production. The animals process two by two into the Ark, which is waiting for them. Top left is a giraffe; lower left centre are two swans. Noah (Arnold Durham) and his family have survived the Flood in the Ark, with the animals. Behind them is the rainbow formed in the Minster choir roof. 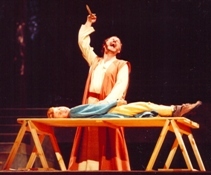 Abraham (Alan Booty) has prepared his son Isaak for a sacrifice and is about to plunge in the knife. But God calls him and tells him to save Isaak and sacrifice a lamb instead. Gabriel (Tom Davey) visits the Virgin Mary (Frances Marshall) to tell her she will bear a child at God's command. It is traditional for Gabriel to carry a lily in paintings of this Annunciation. The shepherds near Bethlehem have come to see the new-born Jesus. 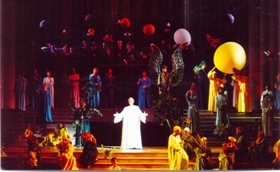 In green is Joseph (Ged Murray). 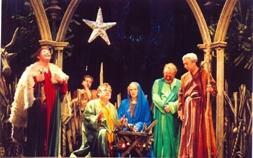 Over the stable hangs the star which the three Kings will also follow. 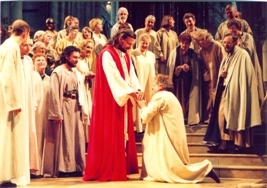 Jesus (Ray Stevenson) is surrounded by disciples as he performs his ministry and healing. 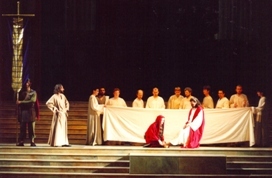 Mary Magdalene (Sarah Jane Wolverson) washes Jesus feet while the disciples prepare to eat the last supper, and puts expensive ointment on his feet. 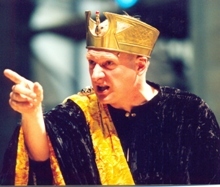 Herod (Tim Holman) is angry about any suggestion that Jesus dares claim to be King of the Jews. Jesus has been condemned to death by crucifixion and forced by Roman soldiers must carry the cross up to Gethsemane himself. He is watched by his family and disciples. 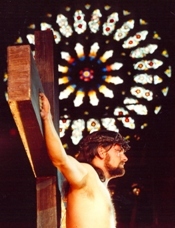 Jesus (Ray Stevenson) is on the cross and dying. Here the rose window of the Minster south transept is in the background. After he is resurrected from the grave, Jesus with God judges good and bad souls. Here the angel blows the trumpet which symbolises the Last Judgement. 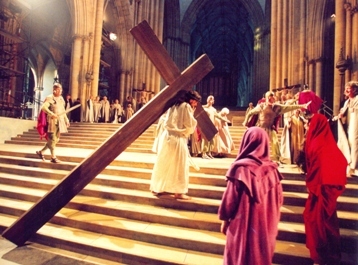 Below, the Dean reflects when the production has ended. Back to 2000 cast list. 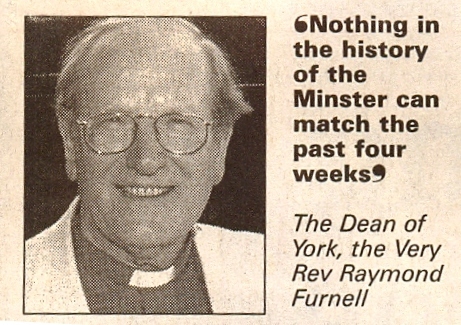 Back to York Minster and the Future.